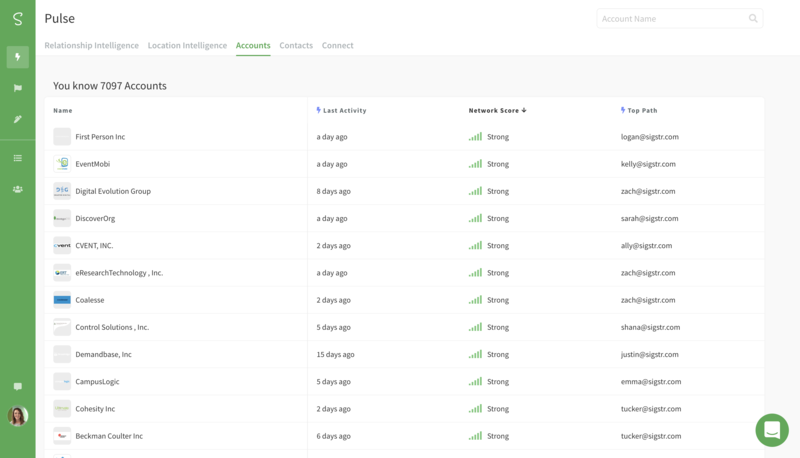 Sigstr Relationships allows you to keep relationships with target accounts front and center. View and sort all of the accounts your company deals with, or segment them into the groups that matter most to your company. Then use those lists to create more powerful and personalized account based initiatives. Understand Relationships - Whether it’s your top 10 or your top 1,000 target accounts, Sigstr Relationships makes it easy for marketers to understand how the relationships within those accounts are developing at scale. 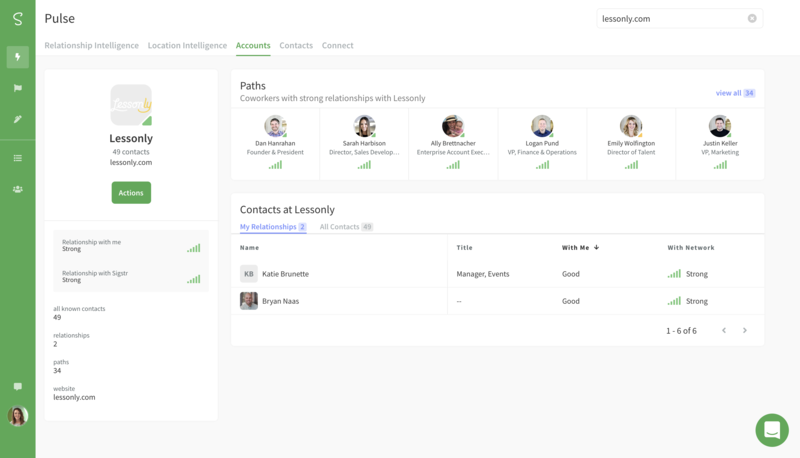 Monitor Activity- Easily build lists based on your sales reps’ key accounts to analyze and optimize their outreach and sales tactics through the entire sales funnel. Marketers can use this information to provide better air coverage. Sales leadership can use it to coach and forecast. View Account Trends - Understand which account relationships are improving and which ones aren’t moving or are degrading. Use those lists to optimize your account-based spend or leverage our integrations to automatically optimize marketing’s influence. Gain Alignment - When marketing and sales commit to creating better relationships within target accounts, they can work together to make sure every touchpoint goes to the right people and leaves a lasting impression. Optimize Engagement - You’re running your account-based plays through a variety of tools and mediums with one goal: improving engagement. When you use Sigstr Relationships to analyze how those plays influence relationships, you can optimize those plays and better understand the customer profiles where they work best. Navigate to the Sigstr Relationships section in Sigstr and select Accounts. 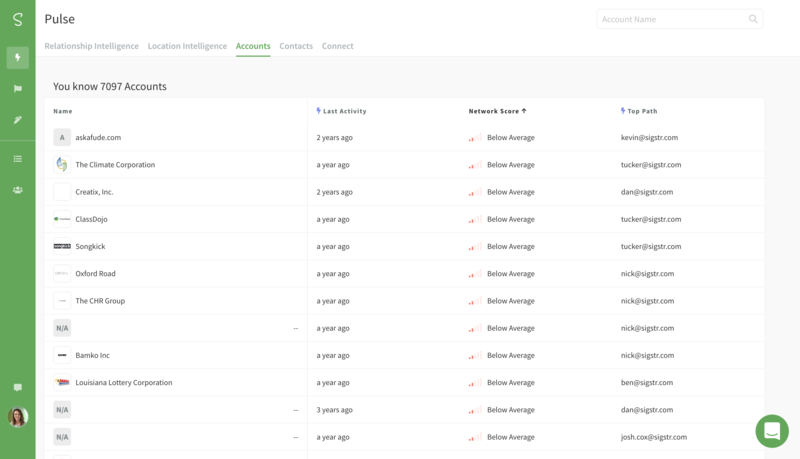 On the main page, find a list of accounts your company is connected to as well as details around last activity, network score, and top path. 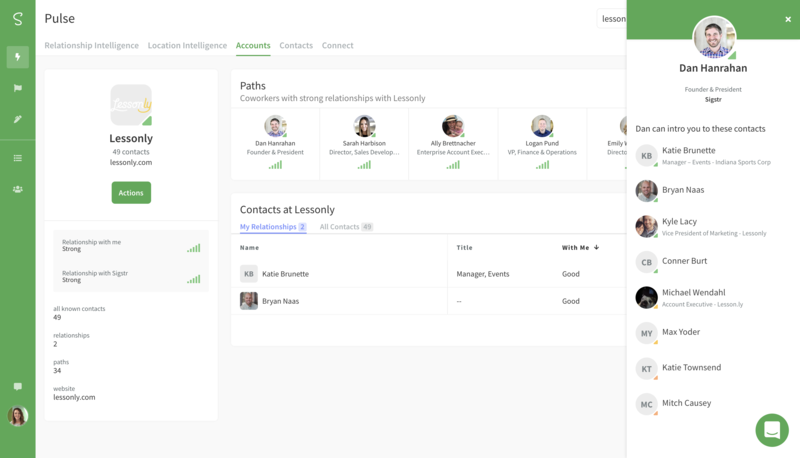 Use the sorting option to see which companies you have strong relationships with and where improvement is needed. Search for a specific account using the search bar. View your top paths and relationships. Click on a coworker's name to see a full list of every contact he or she can introduce you to in that account.